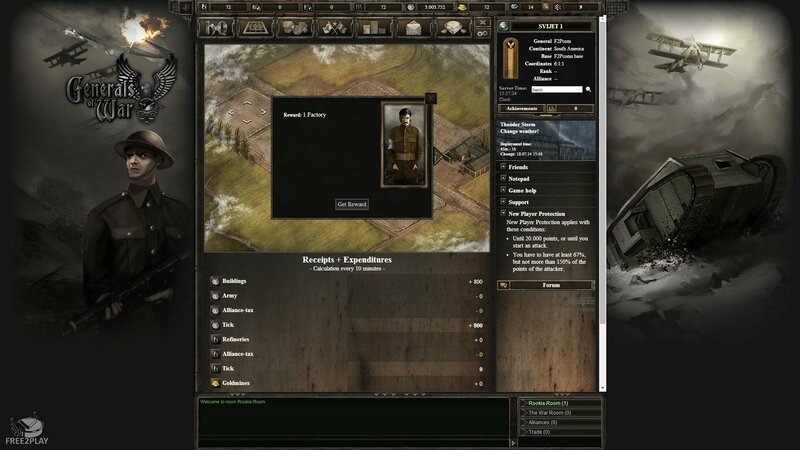 Generals of War is an exciting strategy focused free to play MMO that can be accessed through a players web browser where they take charge of their own WW1 headquarters and must raise an army to fight against their enemies. 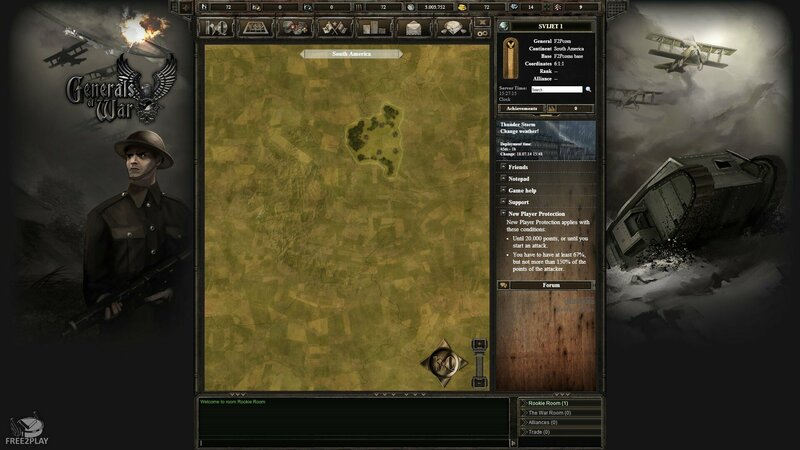 Resource acquisition and management is vital to being successful in the game, with six different resources that players must access (Gold, Money, Ammunition and Oil, which can be converted into gasoline or diesel) these resources are spent on construction of buildings and units, maintenance and upkeep as well as research. 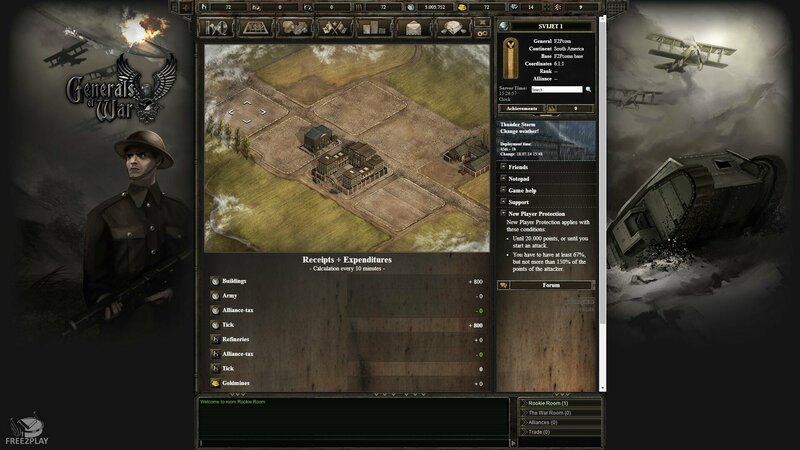 As players progress into the game then need for more resources will ever increase and so they must find new ways to acquire them including upgrading their resource production buildings (Ordinance Factory, Oil Derrick, Manor, etc. ), trading with other players through direct exchange or diplomatic negotiations or simply attacking their rivals to claim their resources. 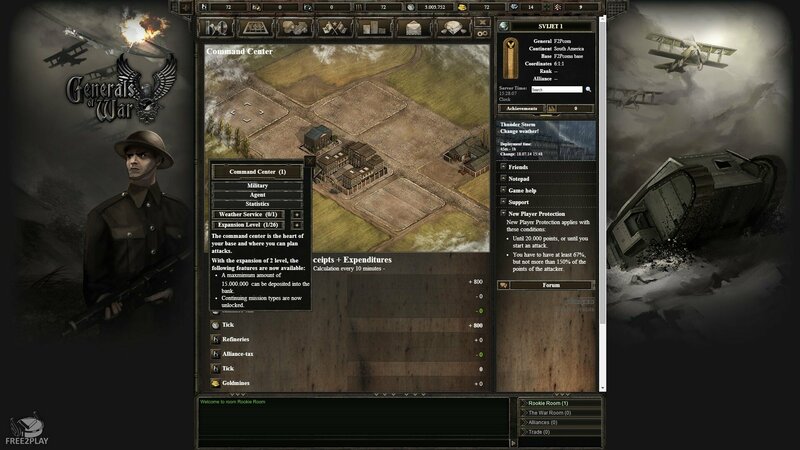 Upon building a University a player is able to research new unit types, made up from Infantry, Marine, Aviation, Tanks and more, each of which requires an amount of money invested into it to research that particular unit before it is accessible as well as the corresponding building that produces them. Units also require resources to construct/train and ongoing maintenance to use them, as well is this it takes time to fully train up a unit (or construct/upgrade a building) which can range from anything from a few seconds for the lowest units to hours for the highest units. Each unit has both a defence and attack value, showing where its main strengths lie and how it would best be utilised in battle either for aggressive offensive attacks or defensive tactics. When in battle and armies combined attack value (made up of all units) matched against the oppositions defence value to determine who will be the victor. Generals are able to train up a wide variety of different military units once they have explored the appropriate research path, these units have both an attack value and a defence value representing how well they will perform as an offensive or defensive unit. The combination of units in a players army will give an overall score when making an attack determined by their collective attack value, similarly when a player is defending their territory their collective defensive value will determine how well they will perform in battle. It can take seconds, minutes or hours to train up an individual unit and each unit has a cost associated to it to not only initially train the unit but also maintain it with an ongoing cost.